As a final project in their 3rd year of the University of Technology Sydney, [James] and a few classmates put together this interesting game. Called BrainTap, it is described as a game targeted at the baby boomers focusing on fine motor skills and memory. The game plays similar to the common game “simon”. The box lights up a series of LEDs in a pattern, then you have to repeat the pattern back with the corresponding buttons in the glove. There is vibration feedback in the glove as well as the lights and sounds you see in the video. Though they do mention arthritis in their title, we don’t think our grandmas with arthritis would enjoy those hand motions much. We, however, might spend hours doing this instead of more important things. We particularly like the visual construction of the game box. The case was designed in CAD, 3d printed, then sanded smooth and painted with automotive paint to get that perfect finish. Great job guys. [Bruce Land] sent in this cool final project for ECE 4760 at Cornell University. Dubbed TrckrX, it is an OBD-II tracking and data logging system built into a BMW E36 M3. The car in question is being used in some auotocross competitions. The driver wanted instant access to some data as well as a log of everything for later analysis. The unit gives a real time display of vehicle speed, coolant temp, and RPM. G-force and timestamps are stored on the SD card. We think this is a very cool idea, and could be quite useful in some instances. The real time display of speed and RPM seem a bit peculiar as the car’s speedometer and tachometer are more appropriately placed for real time information. However, we completely understand that this was a class project and this person may not have wanted to replace their dash cluster with a new readout. This final project at MIT turned out quite nice. 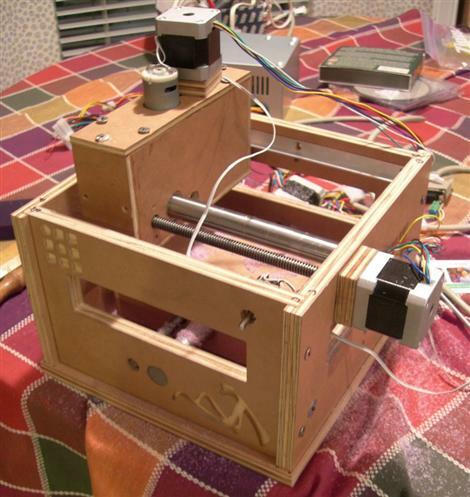 It is a CNC mill that cost under $100 to make. The tolerances are pretty tight as you can see in the pictures of the PCBs he has milled. He shows that he can even mill mild steel. It is a pretty brief writeup, but you can download build instructions and pcb files. [Johhny chung Lee], eat your heart out. Check out what these guys are doing with face tracking and immersive 3d as their final project in class. They’re using a singe camera and an FPGA to produce the demo you see in the video. Facial tracking is done by skin color, so that might have some issues in some environments, but being able to have perspective shift with you, without rigging up some more hardware is fantastic. We realize that this is completely different that what [Johnny] is doing. We love [Johnny]’s work and think it is ground breaking to be able to pull this stuff off with a cheap game controller. We just couldn’t help but draw the parallel from the end result.